Leaner Tip: Substitute pork bacon with turkey bacon to reduce recipe by ~40 calories per oz. Preheat the oven to 390F(200C). Wash the mushrooms, remove the stems, and set aside. 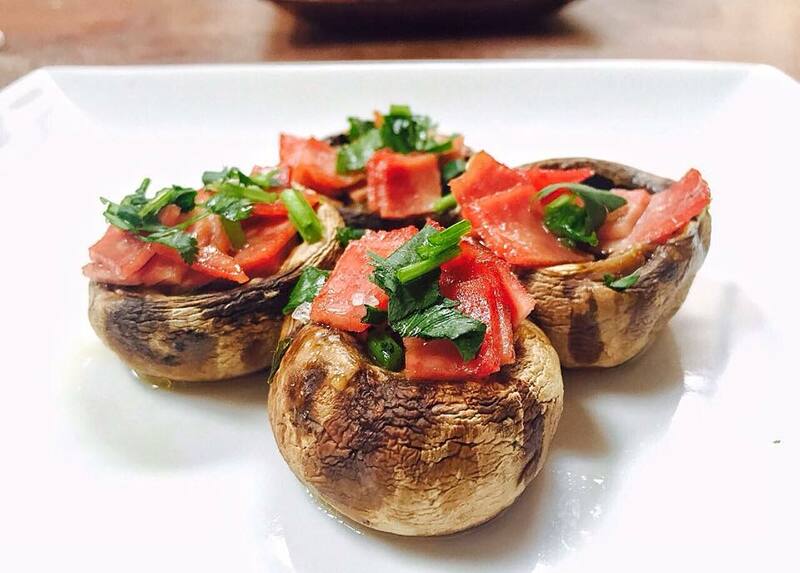 Add about 1/2 tsp of extra virgin olive oil and 1/2 tsp of lemon juice inside each mushroom. Mince fresh garlic and distribute evenly to each mushroom. Also, distribute salt and paprika equally for each mushroom. Chop the turkey bacon into 1/2″ slices and distribute evenly on top of each mushroom. Seal the tin foil on top of the mushrooms prior to placing the dish in the oven. Important, be sure to leave an opening about 5″ to let some of moisture out while baking. Mince cilantro and sprinkle across all mushrooms.